Dragon Judo Club is led by Graham Moore who has a passion for the sport having been involved as a tutor, competitor and player for over 30 years. 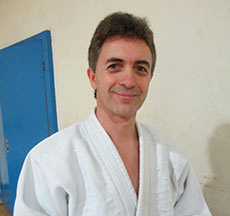 Graham is registered with the British Judo Association (first Dan black belt) and has been a BJA Coach with professional teaching experience spanning the past decade. He is fully insured and holds a full and valid CRB police check. Through Dragon Judo Club, Graham teaches and assesses beginners and more experienced judo players using the BJA grading system, which is recognised across the European Union. Graham's professionalism & integrity is important and means your child will earn grades they can be proud of and you will know they have earned them properly. He maintains outstanding grading standards to ensure all pupils learn every skill to the highest level. This enables his students to enjoy the sport and reach their full potential without taking unfair and damaging shortcuts. As a parent, Graham has a solid understanding of how to work with children - and adults - from a wide range of backgrounds. © 2017 Dragon Judo Club. All rights reserved.